New York : Simon & Schuster, c2000. Provides advice for aspiring novelists on preparing a manuscript for a literary agent or editor, writing readable dialogue, and using other techniques to begin a work so that publishers will want to publish it and readers will want to read it. I have never written a book for publication. Well - that is not quite true. I wrote one once long ago that was immature and frankly boring, and was rightly rejected once and I never tried again! Since then I have not found time to produce a better effort. With all that out in the open, I can say I am reviewing this book as an interested writer rather than a (currently) aspiring writer. Although had I read this book back in the day I wrote my one manuscript, I would have produced something very different. To be clear, this book is not a manual on how to write a book. The author's advice there is really just to get on and write! But this book focuses on how to get your book noticed and thus published. For this purpose I can think of no better book. Speaking with the experience of having been an editor and then an agent, the author brings real world experience of what it is like to work through a large pile of manuscripts, and the tricks of the trade that are used to whittle that list down to something manageable. His advice is that a book must grab the reader in the first five pages, and avoid some key and common stylistic errors in order to get noticed. (Other tricks on piquing an editor's interest are included too). Some will consider this advice and say "well that just means that good stories are getting rejected without being read". And the answer there is presumably: "yes, they are. But follow this advice and yours won't be one of them". This book offers writers a good view into the world of slush that editors and agents wade through every day. As a prospective Author (since I'm already a writer) its offers tips on how to keep a manuscript towards the top of the pile. The book may be of use to the novice writer who has no knowledge of the publishing industry or of the craft of writing. For myself, I found it a bit facile, to the point I would expect this book to be standard reading in a secondary school creative writing course. This is a practical book for those who want to publish novels and short stories. While it doesn't delve too deeply into the conventions of narrative and style, it provides some useful tips for avoiding common mistakes and punching up your writing. This is a good instructional manual for beginning writers. The negative examples are too obvious and simplified to be much help, but the advice is sound. I want (need?) to read this book before I write any more of my fiction piece. When you try to sell a book to a publisher, one of the things you send them is the first few pages of your manuscript. This book promises a discussion of how best to present your work to a publisher, but what it actually delivers is a detailed discussion of how to write good prose at a low level: the use of parts of speech, "show, don't tell", euphony, and so on. It makes only a brief attempt to deal with higher-level issues such as plot and characterisation, though the author has a book on those subjects too. Easy to read tips on how to submit your manuscript as attractively as possible. Detailed, yet very basic. It covers a lot of ground that should be a given--spell things right, proper manuscript format--and seems to expect your first five pages have not yet been written. Put it on your "borrow" list, and think about buying Lukeman's other book, The Plot Thickens.
" This is not a novel to be tossed aside lightly. It should be thrown with great force. " Having been doggedly customer reviewing for over a decade, I've received my fair share of solicitations to review terrible self-published novels. It takes unquestionable intellectual ability and focus to turn out 200 pages of uninterrupted prose (it is certainly beyond me: I've tried on many occasions and always given up, hence I stick to a length - book reviewing - I can cope with), and frequently these books are imaginative in scope. But from the first page, you just know they're no good, purely from the prose style. 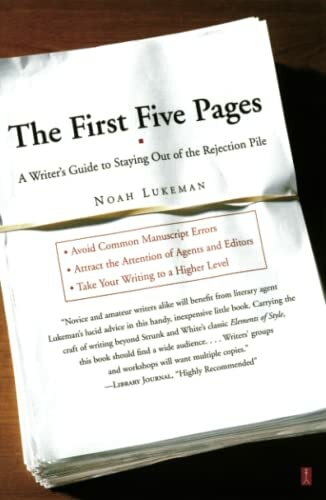 This book is one I would commend to all those authors: it addresses the most common categories of prose misjudgement that amateur writers make. Many of them are eminently correctable. Much boils down to "if in doubt, and frequently, even when not in doubt, leave it out". I have heard this expressed in the aphorism "murder your darlings". Amateur novels tend to be colossally over-written. A confident writer will not need to over-woo his audience, and is secure enough to leave the "world-building" to his reader. Lukeman does the great service of going, systematically and thoroughly, through the ways you might do weed out overwriting. He supposes (correctly) that you'll already have a manuscript, and that the job is thus one of editing rather that prospective composition. The first part of this book is first rate on why adverbs and adjectives should *generally* be avoided like the plague. First timers tend to ladle them on. (The need for a modifier implies weakness in the selection of a noun or verb. So choose better nouns and verbs). His discussion of dialogue, characterisation, and setting - and critically, their interaction with the plot - is also enlightening. The book does tail off in enthusiasm towards the end (despite discussing it Lukeman hasn't any practical advice for how to deal with pacing or tone, although it's hard to think what such advice might be) and his text is blighted by his own use of obviously made-up, exaggerated examples of "bad" writing: presumably Lukeman has waste-takers full of real examples, and these would ring more truly for his target audience and better emphasise his point. Many books on writing focus on what *to* do in hope for success, yet this is such a broad spectrum that such advice will most likely only help certain types of authors. The "do nots" are more specific, therefore Noah Lukeman's advice of what a writer should avoid is well worth paying attention to. His own writing style is straightforward, which is how advice ought to be. One of the better volumes on how to write a novel. It starts in the beginning and without an initial strong impression you are not going anywhere. While I don't consider myself a writer, I still found this book useful in helping me better understand why I like some books and hate others. Concise and direct read that allows you to get straight to the problem(s) and back to writing, quickly. I can see why my English Writing instructor recommended this to me on a side note. Informative, easy to digest, and covers all the important factors of getting past the the first cut. I loved this book so much that I have added it to my list of "to buy". It has great info along with practical exercises to help improve your writing. It is also set up so that you can work on your problem areas and not worry about the what is working for you. This is a fantastic book. It goes over a lot of concepts and offers practical solutions. Also, many of the examples that the author has in the book are laugh out loud hilarious. I enjoyed it. It would be a good book to read once a year. One of the best books I've read if you're sending off to agents and publishers and if you're self editing. As you might guess from the title, Lukeman explains exactly what agents look for in order to reject your mss by reading as few pages as possible. It starts from the mechanics of presentation and then works through the other hurdles in rejection potential order from micro things like too many adjectives all the way up to pacing, character arcs and loads more. This book is probably the only resource out there that spells out (using egregious examples) all the bad habits your editor keeps scribbling all over your manuscripts that you look at and go "WHAT? What does this MEAN?" None of these bad habits are unique to writing how-to books. Every book out there (and I've read a lot) TELLS you to eliminate these bad habits. Eliminate unnecessary adverbs. Show don't tell. Blah blah blah... But this is the only book out there that teaches you to SPOT these bad habits in your OWN writing when you know something's a little off, but you can't quite put your finger on it. It's as though a lightbulb goes off in your head. You can then go through your OWN manuscript chapter by chapter and see you've used one 'comparison' too many per page, or know how to reword that clunky spot of dialogue that keeps giving you trouble no matter how many times you rewrite it, or spot when your writing is reading more like a police report rather than prose.